Brussels, 26 June 2018 – The European Humanist Federation is pleased to launch the “Believe it or not! 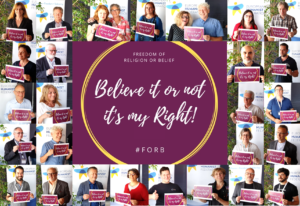 It’s my right” campaign (https://forb-defenders.org) together with the European Platform against Religious Intolerance and Discrimination (EPRID), Christian Solidarity Worldwide (CSW) and the International Humanist and Ethical Union (IHEU). The campaign pursues three main objectives: raising awareness about freedom of thought, conscience, religion or belief (FoRB), expressing worldwide solidarity with people discriminated and persecuted for their thoughts and beliefs, whether these are religious or not and calling on legislators, policymakers and diplomats to more robustly defend and protect FoRB in the world. For the European Humanist Federation, this campaign is fundamentally important, as it rightly recalls that freedom of thought, conscience, religion or belief is a fundamental right of paramount importance for everyone, non-religious and religious people alike. It includes the right to change or to leave one’s religion or belief, as well as the right to hold no religion or not to believe. It is urgent that European policy-makers and diplomats urgently take action in defense of the increasing number of people who are discriminated and persecuted worldwide because of their thoughts or beliefs, whether these are religious or not. said Giulio Ercolessi, the President of the European Humanist Federation. Coverage of the persecutions of Christians in the world has been growing in the last years. What has remained less visible is that many other people face similar discriminations and persecutions, including people of minority faiths as well as many humanists, atheists, apostates, free thinkers and people whose life stances do not fit the mainstream religious doctrine of certain countries. We are therefore very pleased that organisations with religious backgrounds such as EPRID and CSW recognize the need to campaign together so as to urge the protection of all those who are persecuted for their beliefs. We hope that next steps will include the recognition that laws penalizing blasphemy are also an obstacle in the furthering of FoRB in our societies. The International Humanist and Ethical Union’s Freedom of Thought Report 2017 identified that 85 countries around the world have severe discrimination against atheists and humanists and in 13 countries blasphemy and apostasy (the act of leaving a religion) are a capital offense.